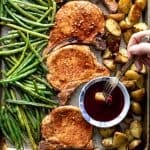 This family friendly Sheet Pan Pork Chop dinner is super easy and a total lifesaver! I mean who on earth doesn’t love more time and less dishes? That’s just what you’ll get when you make it plus a whole pan of roasty toasty potatoes paired with green beans and garlicky juicy chops. All served up with a sweet and tangy home-made raspberry ketchup sauce. 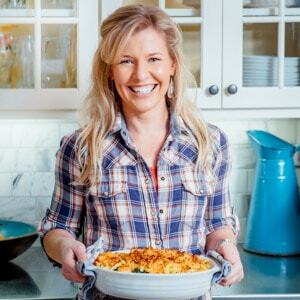 Read on to find out how it all comes together and get ready to meet your next weeknight fave. 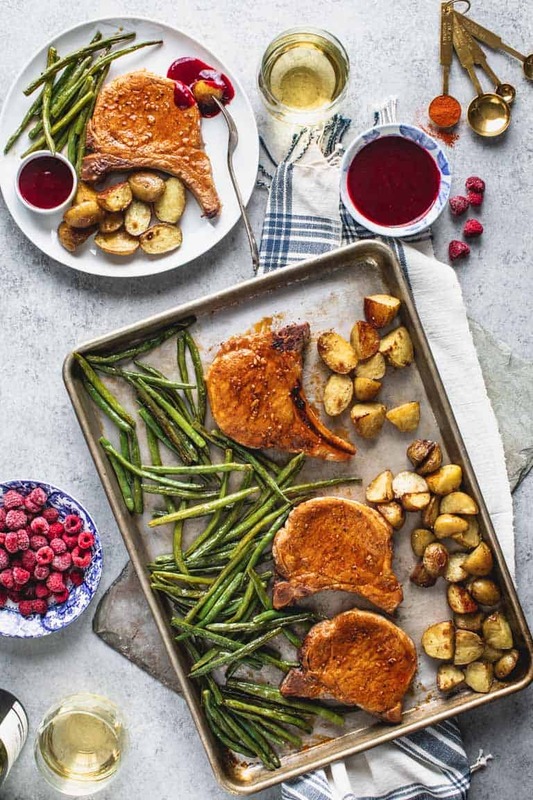 DISCLOSURE: These Sheet Pan Pork Chops are brought to you today in partnership with the National Processed Raspberry Council. I was compensated for my time. All opinions expressed here are my own. Ask and you shall receive! Earlier this year I asked you all on Instagram and via my weekly email what kind of recipes you wanted to see more of around here, and overwhelmingly you all voted in favor of more sheet pan dinners. Well, you didn’t have to tell me twice because that sounded like a great idea! I mean I could use more of them in my life that’s for sure. This Sheet Pan Pork Chop dinner was the first idea I came up with. I wanted to make this a complete meal, so I devoted one pan to roasted potatoes. They take a little while longer than the pork, so I got them into the oven asap. Then I used a second sheet pan to roast pork chops and green beans. From there, I knew the meal would need a kick of flavor. And I also wanted to showcase frozen raspberries in an unexpected way. As you know I have been working with the National Processed Raspberry Council to come up with innovative recipes using frozen raspberries. In the past I have used them for Festive Holiday Slaw, Chocolate Raspberry Muffins and Raspberry Vinaigrette. One of the things I love about using frozen raspberries, is that not only are they picked and frozen at their peak of ripeness, so I can enjoy perfectly ripe raspberries when they are not in season, but I love how they can become so juicy and saucy when they thaw. I think this is a big asset, especially when turning them into sauces or as in the dressing for the slaw I mentioned. That is how the idea of turning frozen raspberries into an easy ketchup sauce came into my little brain. Before you knew it, there I was mixing and simmering. I tried several versions of this raspberry ketchup, and ended up really simplifying the ingredients. (I had used some herbs and spices in earlier versions, but I decided I just wanted the flavor of the sweet tart raspberries and the honey to come through, so I omitted them. This version was hands-down the family favorite. Just the right balance of acidity and sweetness. Perfect for dunking those roasted spuds, or swiping a forkful of pork through. Start with a hot oven. 425 degrees is just right. The reason you want the oven so hot, is it encourages browning, and prevents the pork from simmering in its own juices too much. At this point, you can also put one of your sheet pans into the oven. That will pre-heat it, so when you place your pork on it, the pork will sear better. Next get the potatoes roasting asap. Just toss them in a bit of oil, salt and pepper and pop them into the oven. Once the potatoes go in you have 10 or 15 minutes to prep the pork and green beans. The green beans, just need to be trimmed (stem-end removed) and then tossed with a little olive oil, salt and pepper. The pork does need a bit of help in the flavor department. That’s how I came up with the garlic oil and spice combo. It’s a mixture of minced garlic, olive oil, salt, pepper and paprika. Just brush it over the pork, and it will add a world of flavor to the final dish. When there is about 20 minutes left on your timer, that’s when you’ll pull that extra preheated sheetpan out of the oven and arrange the pork and green beans on it. Get them roasting too. Then it’s time to make the ketchup. The frozen raspberries work really well in this recipe because as they melt, they let out a lot of liquid, which helps to create the sauce. No need to break them down or mash them! Just stir every so often. I simmered the ketchup until the mixture was thick enough so when I was stirring you could see the bottom of the saucepan. Once the ketchup is thick, strain out the seeds through a fine mesh sieve. Note: you can see what this looks like in my video. Just be patient. Work the mixture through with your spatula. You should end up with about ½ cup to 2/3 cup ketchup depending on how much you simmered it down. Let the pork chops rest a few moments before serving. It’s okay if the juices from the pork get on the green beans, it’ll taste great! If you didn’t have a chance to respond to me earlier, let me know what kind of recipe you would like to see here this spring. Have you ever tried making home-made ketchup? 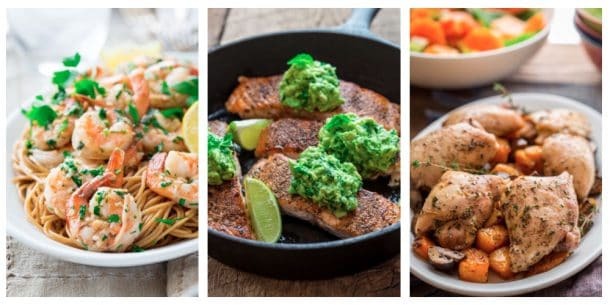 What is your favorite sheet pan dinner? 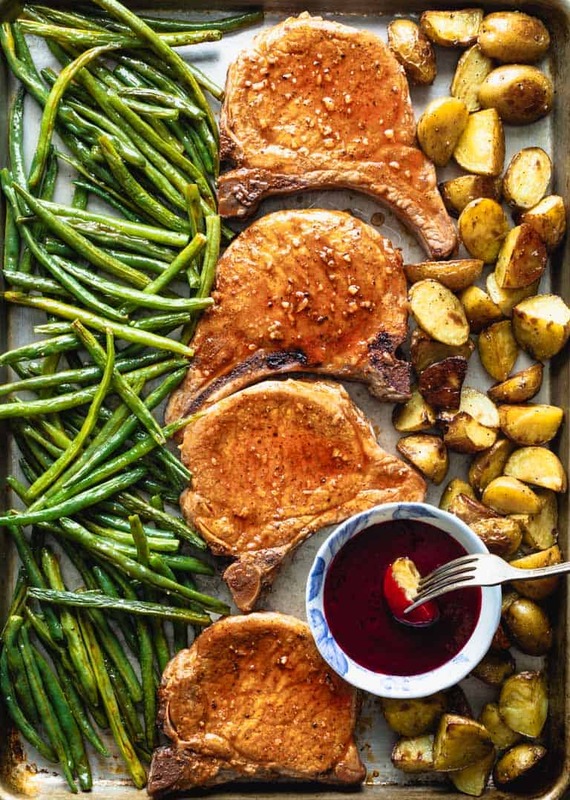 A complete meal: Pork Chops, potatoes and green beans roasted on two sheet pans. While they bake, make easy raspberry ketchup on the stove-top to serve with the pork and veggies. Arrange oven racks evenly spaced in upper and lower thirds of the oven. Set one sheet pan in the oven to preheat it. Preheat oven to 425 degrees F.
Toss potatoes with 1 tablespoon oil, ½ teaspoon salt and pepper. Spread the potatoes on another (room temperature) baking sheet and transfer to the oven and set a timer for 35 minutes. Stir 1 tablespoon oil, garlic, paprika, ¾ teaspoon salt and pepper to taste in a small bowl. Brush over the pork chops. Toss the green beans with the remaining 2 teaspoons oil and remaining ¼ teaspoon salt and pepper to taste in a large bowl. When the timer has 20 minutes remaining, remove the pre-heated pan from the oven and spread the green beans on one side and the pork chops on the other. Immediately transfer to the oven. Roast until an instant read thermometer inserted into the thickest part of the pork, near the bone registers 145 degrees, 16 to 19 minutes. Meanwhile, bring raspberries, honey, shallot, vinegar and ½ teaspoon salt to a simmer in a saucepan over medium high heat, stirring often. Reduce heat and simmer until thick, 5 to 8 minutes. Strain out the seeds by pressing though a fine-mesh sieve and set aside. 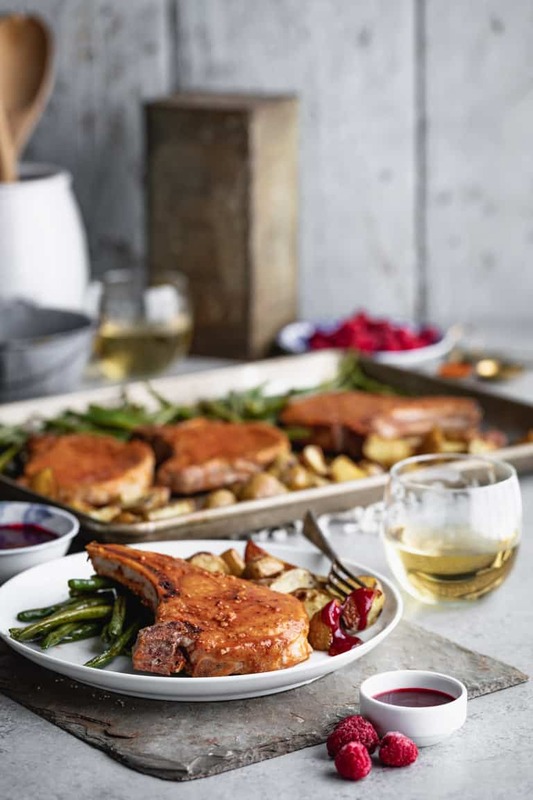 Serve the pork chops, potatoes and green beans hot, drizzled with the raspberry sauce. Chantal, you totally should try it. I promise, you’ll be hooked! Thanks so much Matt! Raspberries do go great with pork- and thank you for taking the time to leave a rating! The raspberry ketch-up sounds fantastic!! I love sheet pan dinners and this sounds like a great one. It is so straightforward and well balanced with the veggies, yum!! Thanks for sharing. Thanks Adrianne! I love sheet pan dinners as well- they save so much time! I think you’ll love the ketchup! And thanks so much for rating my recipe! This looks SO yummy Katie! I’m definitely a huge fan of sheet pan dinners too 🙂 It’s been awhile since I’ve made pork chops-can’t wait to make these! Let me know what you think when you try this one! Thanks so much for the comment and for rating my recipe! I love the sheet pan dinner!! 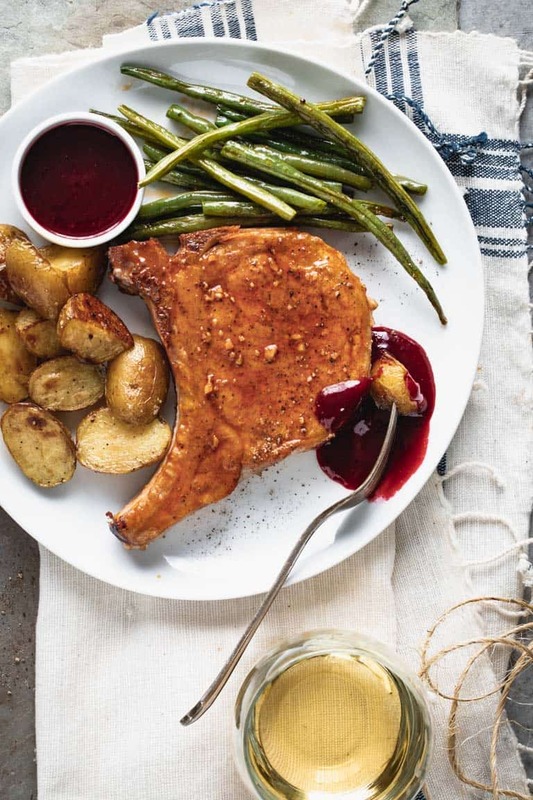 I especially love the raspberry ketchup, perfect to serve with the pork chops! Thanks Pam! 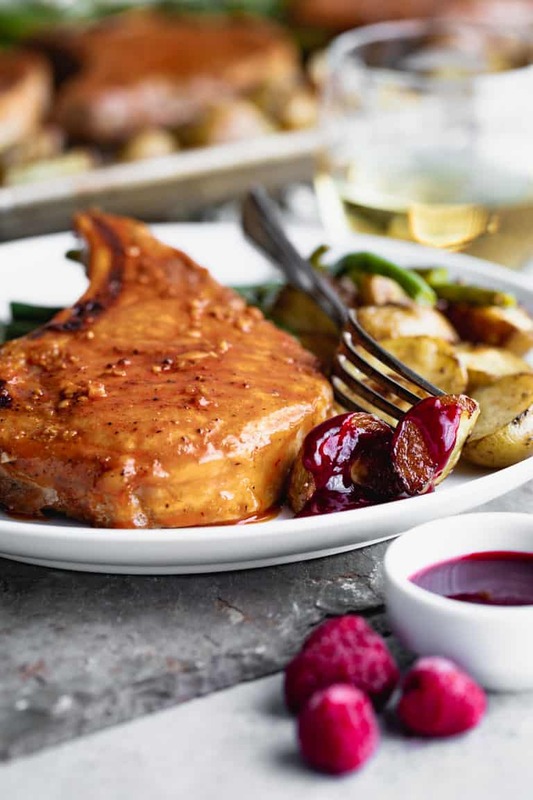 I’ve found the raspberry ketchup is definitely a hit with the pork chops 🙂 Thank you for rating my recipe as well! Does it matter which oven rack (upper or lower) each of the sheet pans (potatoes or chops/beans) goes onto? Hi Jim, no it shouldn’t matter. If one of yours tends to be hotter, you could always swap/move the potatoes when you put the pork and beans in. One sheet cooking is the way to go! Was so easy and quick! Joni- I totally agree! Anything that makes things a bit faster on a busy evening is something I love! Thanks for the comment and rating! I adore sheet pan dinners and use them at least once a week! Thank you for adding to my meal plan! That raspberry ketchup though! Wow! Hey Renee- thanks so much for the comment and rating! So glad to be able to add a meal to your planning! I’ve never been able to get pork chops to work for me. But these look so delicious I might have to try again! Raia, Thanks so much for the comment and the rating! You should definitely give pork chops another try! The raspberry sauce was fabu, really set the flavors off! Thanks for a quick and easy dinner! Tessa, I’m so glad you loved the raspberry sauce! Thanks so much for your comment and rating! Just had to comment to let you know we all loved this dinner. The raspberry ketchup was SO good. And I loved having the rest of the dinner bake on one pan, so easy! Thank you!! Will definitely make again! Hey Megan! Thanks so much for the comment and rating. So glad you all loved it, and the raspberry ketchup can be a bit addicting! I thought it was just going to be the pork chops and veggies and already loved it. But then you add that ketchup! Amazing! Can’t wait to try this. The ketchup adds a little something extra- hope you love it! Thanks so much for the comment and rating! winner winner pork dinner! family loved this! beware though – you will find yourself dipping all things edible into the raspberry ketchup! Eve- I agree, that ketchup is addicting! Thanks so much for the comment and for rating my recipe! Glad you loved it! Raspberry ketchup? That’s super cool. What a fun twist on a great looking sheet pan dinner. So glad you think it’s a good idea. Let me know if you try it Kelly! Have a great day. I am thinking I need to start making bigger batches of this ketchup. It’s so incredibly good! What a stunning dinner, I just love all the photos, and of course you just can’t beat a sheet pan meal! Hi Kari! Thanks so much! I do love sheetpan dinners, this is such a great easy way to enjoy lamb chops. That raspberry ketchup was a hit! I may just keep some in the fridge for other meals – yum! I hadn’t thought of trying lamb with this recipe. I bet loin chops would work. But probably don’t need as much time in the oven. Let me know if you do try that swap. Sheet pan meals are the best! And that ketchup sound amazing too! Thanks Anne. I hope you will let me know if you try it! Making this in a couple of days. A sheet pan dinner will be perfect for a busy weeknight! That’s music to my ears. Please come back to let me know, or tag me on instagram. I’d love to know how it comes out for you!